The Starship Catan board/card game is another great 2-player game from the Catan universe, again set in space. Although many people call this a "card game", and although cards are an important part of the game mechanic, this game comes with many high-quality components that make it much more than just a deck of cards. Each player receives a thick cardboard starship board into which you can add thick cardboard booster and cannon pieces. Starship Catan truly bridges the gap between board games and card games. With Starship Catan, the designer Klaus Teuber gets further and further away from the original Settlers of Catan. There are still resources to collect and things to buy, but this game really stands on its own. People who loved Settlers shouldn't necessarily buy Starship Catan, and people who hated Settlers shouldn't be prejudiced against it. This entertaining 2 player game reminds us of the Star Trek Voyager series on TV: players are warped off into distance space and have to trade and explore in order to return home. Despite being a two player game, it's not very adversarial. Although there are chances for the players to directly affect one another, you play against the game universe more than each other. Don't worry about waiting on the sidelines while your partner takes their turn; in Starship Catan you'll be involved in the mechanics of the other player's turn. Also, you'd be wise to pay close attention to the action for your partner. An important part of the game is trading resources in four "space sectors", each one being a randomized deck of 10 "planet" cards. Players who want to excel at trading resources for money have to be able to memorise profitable trading routes through the sectors. 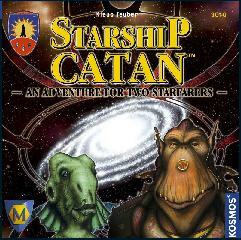 Starship Catan is an exciting game with a clear and easy mechanic and a fantastic theme. We feel it doesn't compete with other Catan titles, but complements them nicely. For those times when only two players can get together, our choice is often between Starship Catan and The Settlers of Catan Card Game. However because the games are so different, we usually find that one suits the mood better than the other. For gamers who want a great 2 player game that only takes about an hour, or for gamers who want to increase their 2 player options, Starship Catan will make a fun and exciting addition to your games cabinet.